Pancreatic Enzyme is a digestive supplement containing the Pancreatic Enzymes: Lipase, Amylase and Protease to assist the digestion and absorption of fat, carbohydrates and proteins. This mixture of digestive enzymes is normally released by the pancreas into the intestine to digest food. Sometimes the production and release of these enzymes is defficient, resulting in poor digestion and weight loss. Exocrine Pancreatic Insufficiency (or EPI) is the name of the condition affecting dogs which is the most common cause of this condition (mostly German Shepherd Dogs in fact). Supplementing the foods with enzymes added to the food before it is eaten is the usual treatment of this condition. Pancreatic Enzyme Powder contains high levels of these enzymes and is usually given for this purpose. It might help with other digestive conditions too and can be given on the recommendation of your vet. Mix with fresh or tinned wet food prior to feeding. The optimum amount may vary with diet composition and individual animals. Please consult your veterinary surgeon for further advice. Minimum use rates are recommended below but as a general guide, administer half a 5ml measure with each 100g of wet feed, increasing as necessary, according to the animal's needs. Protein min. 65%; fat content 2%; crude fibre 2.5%, crude ash 5.1%. For use in pet foods (cats & dogs). Do not feed to ruminants. Keep out the sight and reach of children. Wash hands after use. Store in a cool, dry place out of direct sunlight in closed, original container. Below are some recent questions we've received regarding Pancreatic Enzyme, including answers from our team. Hi my pug is on a hydrolysed diet and she has SID high foliate. She isn't digesting her food as she should . Would the use of enzymes help ? Would the protein from them affect her allergies to food ? Digestive enzyme supplementation is believed sometimes to help with a variety of digestive problems, but it is particularly beneficial only to animals diagnosed with Exocrine Pancreatic Insufficiency (EPI). There are a variety of tests for this condition as well as the clinical signs and usually a diagnosis is not too difficult to make. I would only recommend giving this product if your dog has been diagnosed with EPI. However it is unlikely to cause any trouble for your dog even if EPI has not been diagnosed and an allergy to the enzymes themselves is extremely unlikely. Any bad influence on blood glucose in diabetes dog? My dog is 12 years old and recently diagnosed as diabetes about 3 months ago. We are feeding various vegetables, proteins, and some grains as well for her meal right after insulin shot. She had used to have dog foods only before the diabetes diagnose. Since we are seeing her having some difficulties in digestion of her meal, we are thinking of giving your product (Pancrex) to help her digestion. My question would be whether the Pancrex feeding may cause some increase in her blood clucose level of my dog in this particular situation. Changing anything with your dogs food can theoretically affect blood glucose levels and hence the insulin requirement. If your dog has trouble digesting the food, then Pancrex should be a help, but it would be best to talk to your own vet about this first. There are tests to can suggest (or sometimes show for certain) if Pancrex is needed. Choosing a good diet and sticking to it is also a help, as the digestion gets used to the food and digests it better in time. 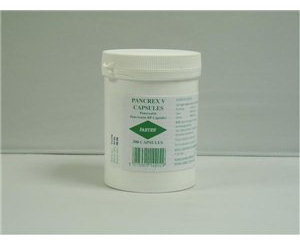 Pancrex tablets - what dose to use? What is the dose of Pancrex Tablets to use for my 39kg dog? There is no fixed dose for this Pancrex tablets. It is intended to replace deficient enzymes produced by your own dog's pancreas. Every dog with this sort of problem will have it to a varying extent. Your dog might produce 10% fewer enzymes, or 90% fewer enzymes, so the amount of supplement needed cannot be predicted. Essentially you pick a middle sort of dose, then increase of decrease according to effect. There is no problem with even a very large overdose. If you give too little, the food will not be digested well (so the faeces are greasy looking and your dog loses weight). For your dog I would start with 6 or 8 tablets per day, added to food. Then after a few days you can increase or decrease this. Hello thank you for all of your previous advice. I have now ordered the Pancrex v tablets - could you please tell me the difference in between the capsules and tablets also the powder, my dog is 25kg although he is now gaining weight as long as he is on three small meals a day. Please could you advise if I should give him one tablet with each meal or would this be too much or maybe one tablet with one meal and half tablet with others. I hope you can help me. The different Pancrex products all contain the same ingredients. The more expensive forms tend to contain more of the active ingredients relative to cost, so you get what you pay for. I would start off with one tablet per meal, and see how things go. If this results in him digesting his food well and keeping a good bodyweight, then that is what you would want to see. It might then be possible to reduce the dose, to say half a tablet for some or all meals, but you can only find out be testing it out. Every dog is different and there is no fixed dose that is needed for any of these products. Some dogs might need an even larger dose in time, if their own pancreas stops producing any digestive enzymes at all. Mostly the pancreas continues to work to some extent, but it just needs a bit of help. You will build up a picture over time as to what is needed for your dog, and that is the best way to approach it. 25kg is quite a large dog and he might need more in future.